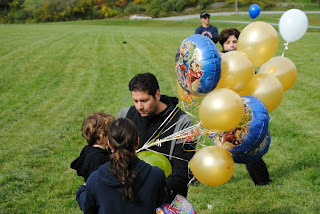 Some beautiful friends and neighbors gathered together to celebrate Ty's fifth birthday with a balloon launch. It was a beautiful day, and Lou brought Gavin to participate in the fun. I stayed home with Ty, of course, but all of the photos that have been shared helps us feel like we were right there with them. It was such a thoughtful way to honor Ty. 150 balloons filled with wishes and prayers for Ty's healing were released. The kids played some football and baseball. 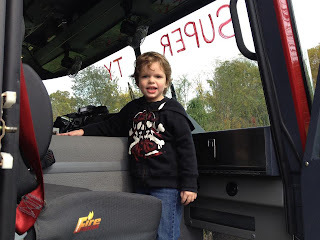 The Pawling Fire Department even brought in a fire truck. Thank you, everyone, so much, with an extra huge thanks to Mellissa. You are doing so much to share Ty's story and to help us feel so loved in our community. Watch out! 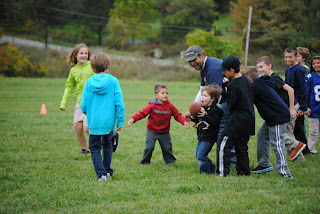 Gavin has the ball! 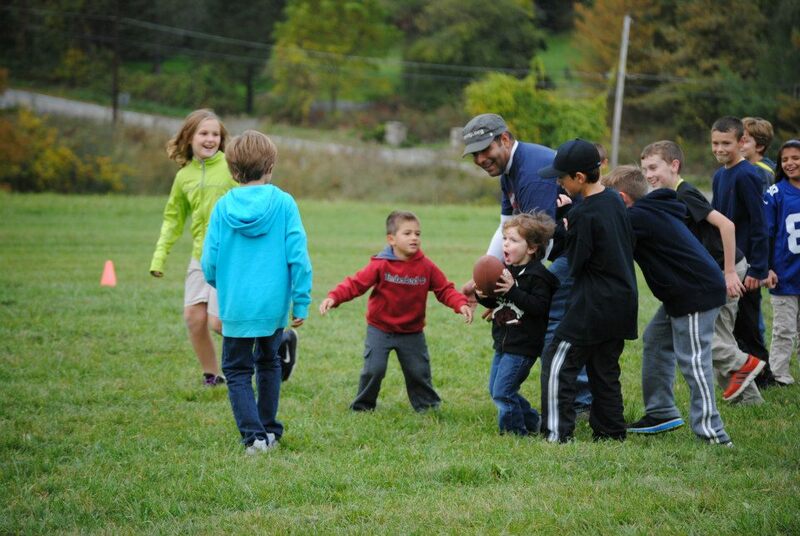 One neighbor even dropped off a video from the event and watching Gavin play in his first football "game" with all the other kids made me so proud. I should probably be a little sad that I couldn't witness it in person - like so many things Gavin has experienced since Ty got sick - but instead I find so much relief in knowing that Gavin is having fun and enjoying his childhood in a very normal way despite this far from normal household he lives in. I love him so much. Lou is watching Monday night football. I wish they would have worn gold in September, even if just for one game. The pink shoes for breast cancer awareness is pretty cool. Maybe next year. Next September I would like to see gold shoelaces for sports teams in elementary schools, middle schools and high schools, actually. That would be amazing. I don't have a photo of today's "smile of the day" but I did get one big smile from our very special boy. It even included a hoarse giggle. Ty was amused when I was making voices while reading a book "There's a bird on your head!" by Mo Willems. Otherwise today was a quiet one. Ty had a terrible night last night. He was vomiting every 30 minutes or so, leaving all of us very tired today. He didn't nap at all, but he was very low energy and he went to bed very early. His nurse was here, we mapped out a plan to try and better medicate his increasing nausea, and we'll see how it goes. 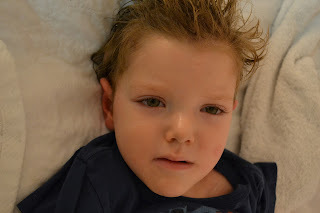 The nausea, we assume, is from all of the neurological changes going on within his central nervous system - causing increased pressure - but his doctors and nurses do not feel he is otherwise progressing. His vitals are very strong. That's wonderful news, but it leaves all of us living in a painful limbo. Living day by day like this is so horrible because we watch Ty suffer and we have such a hard time communicating with him. We continue to pray for improvement, or at least movement in one direction or another so we can put all of this suffering behind us. I know it sounds strange to hear me essentially say that I wish the dying process would speed up, but if you could feel how much it hurts my heart to watch Ty like this, you would understand. I don't want to put this difficult life behind me. All I want is to keep Ty here with me always and forever. But this poor baby has already suffered two years too much, and the only justification I can come up with if his suffering continues at this standstill would be a healing miracle. Please, God, hear our prayers. Save our beautiful boy. Every since I heard about Ty on Rockstar Ronan the other day he is all I can think about. Praying all the time for Ty and your family. No, it doesn't sound strange, sweetie. You are a mother who has watched her child hurt and hurt and hurt. Please know there are so many of us out here praying for a miracle. Give that angel a kiss for me. Watching MNF and thinking of Lou watching the same thing and am also wishing there had been gold shoes in September. P.S. The Jets just got a huge TD. I know it was for Ty. Thinking of you all every day. Cindy you are the most beautiful and peaceful person I have ever heard of my entire life god bless Ty. Fifth that! Amazing beyonds words. I agree. Ty is very lucky to have wonderful parents like you and Lou. Just as you are lucky to have such an amazing child. I pray for Ty and your family every day. Yes..since I knew about Ty a few days ago from Rockstar Ronan's post...all my mind can think is about Ty and how hard I have prayed for a miracle healing for Ty and your family. Oh God, please, please, please, let Ty be the miracle child everyone is praying for, for him to heal and for all his cancer to leave his body, please...hear all our prayers.. And please continue to give strength to Cindy and family. what a fighter he is! he gets it from his mama! lol and his daddy too! Gold shoelaces for next September...most definitely Cindy and Lou. Big hugs and lots of love to sweet, sweet SuperTy. Wouldn't it be wonderful if all sports teams wore gold shoe laces next September? A sea of gold laces!! Strength for you Cindy, Lou & Gavin & a miracle for Ty. God bless you ALL. Laughter - doesn't do a person good?! We read Mo's books too and I love hearing them laugh at the goofiness. Praying for a more peaceful night for everyone. God bless you all. We need to get all the sports to do it in September. Go Gold is what Chrissie and I always try and share. Is there s time we can meet Mikey?? You are only human and not wanting your child to suffer is not too much to ask! I hope with all my heart that God will give you the miracle that Ty deserves! Praying for you! Ever since I heard about Ty on Ronan's page I can't stop thinking and praying about him! You have such a beautiful boy and I still believe in miracles! Heavenly Father,please touch this poor child's body and heal him completely from cancer! May be be a living testimony of your power and glory! We trust you,God,we are believing and waiting for Ty's complete recover! I pray this in Jesus' name,amen!! Complete healing in Jesus' name....AMEN!! Hoping you are having an easy and pain free night and praying and refusing to stop believing in miracle known as Super Ty but of course only if it doesn't involve more suffering for you beautiful baby boy. I literally laughed-out-loud at the ice-pop story. So wonderfully typical. As for colors....boy oh boy, I can't tell you how often, since reading your blog, that the pink ribbon craze gets me crazy.. and that sounds wrong - of COURSE more awareness for breast cancer is great! But how there is not equal or greater awareness for pediatric cancer just doesn't make sense!!! Cindy, believe me, I am on a mission. I haven't figured out how yet, but this is going to change. 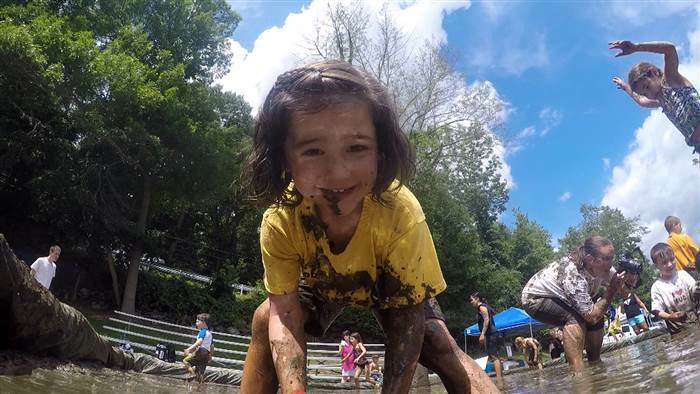 Our town just lost another little girl to cancer (Anna Kopack, for the record). Everyone is broken up about it (of course), and there have been fund raisers for her family (as there should be)... and yet, pediatric cancer doesn't seem to ring familiar! This is going to change. I promise you. I don't know how (yet), but it will. Meantime, prayers continue for Ty, and they always will. I pray from the depths of my soul that Super Ty will be healed. God, please let that happen. Hey Melanie - all it takes is one person to start beating the drum and soon others will follow!!! So just start putting it out in the world that you are working to raise awareness - pushing for a Go Gold in September agenda - and hopefully others that have been inspired by kids like Anna, Ty, Ronan or the countless others fighting cancer, will join you in your efforts. I'll be working on doing it myself too!! I'm thinking we need to get a letter writing campaign going - if I come up with a template I'll post it for everyone to use....we'll send to all the big companies with products and try to get someone on board! I am generally not a praying person, but every ounce of me sends a wish to the universe for the healing of your darling little boy. Dear Cindy , I hada dream last night while laying w//both my boys, it included a gallon release, every media station from the state of tn , && little Ty in your arms, && the amazing part of it all, was childhood cancer was as "known" as the pink ribbon !! I'm doing well so far with the shirt making process && want permission from u, an email would be appreciated, to do some fund raising things, together, we will make childhood cancer awareness happen .. && its all I post about on my fb && Twitter .. plz get better Ty !! it would break all of our hearts if otherwise !! We love u Cindy, little Ty, ga-ga && Lou .. && our prayers are always with y'all !! sofii, Aiden, && Jr ..
Cindy, I have been reading your blog about Ty since day one. Nothing in this world compares to the love you have for your children and the spirit you have. Obviously every mother and father loves their children in leaps and bounds. I suppose I mean the way you have the courage to update us every night with your beautiful strength by telling a story that is the most courageous one I have ever heard in my life. God bless you special girl. i completely understand what you said about hurrying the dying process along. i have not lost a child (thank you Lord) but i lost my dear dad (age 67) to cancer just a few years ago. i love him more than the air i breath and watching him suffer was the worst form of torture. i went from begging God to not take my dad away from me to begging Him to please end his suffering. i never thought i could even survive without my dad but i could not bear to see his pain any longer. a huge part of heart died along with my dad and it will never heal but knowing that he is no longer suffering is comforting. ty is a beautiful, special boy and my heart breaks for you. i pray for you and ty everyday. Felt good to laugh while reading your blog, usually by the end I'm crying. I reminisce my own tragedy losing my entire family to cancer. Reading "funny things boys say & do" how cuuuuute!!! 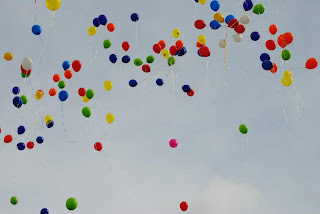 I would've loved to have been there in releasing a balloon or many, many balloons!! Beautiful pictures, amazing memories even if they were from pictures or videos. I'm sorry for your loses. Cindy, how beautiful your comment about letting go of certain "not good" energy in a recent post. You and Ty.. Oh yeah, Lou and GaGa too :) You guys are a most beautiful family. Cindy your positivity runs forever! It helps me get through the day. God bless Super TY!!!! Cindy, your son is so strong and so special, I think about him daily. A miracle is coming, I can just feel it. God Bless Ty!!!!!! GOD bless you baby boy. thinking about you constantly : ) Ty, you are SO special. I hope Ty is sleeping more soundly tonight. You are a wonderful mommy, and an example for all of us to follow. I wish I could take your pain away, but at least know I think of you and your boy every day. From now on, every balloon my little boy releases in the air will be a wish for Ty, a beautiful, brave little angel. Goodnight sweet Ty and Campbell family. May God Bless Ty and get him well soon. Waiting for some Miracle to happen. We all are praying for you little child. My son is of same age as you and being a mother, I can understand pain and suffering you and your family is going through. I hope that this society pay attention at children cancer and do something about it where survival rates are pretty low and children don't even get their few years to live. We made tiny donation to your foundation in hope that cure is found ASAP. Sofii , Aiden, && Jr ..
p.s Mrs Cindy u should listen to the song "give me a sign" by breaking benjamin .. it very much reminds me of ur struggle thru these hard days .. thank u for your time .. && I hope to hear from u soon .. I am praying for healing for Ty every day and hoping he has better days to come!! I LOVE the picture of you and Ty from yesterday's post. Glad you have so many people to support you and your family. We need to stomp out this terrible disease. I am so sorry to hear that Ty has such a bad night could it be the pain meds nauseating him too? I know if I take them I get very nauseated. I know he has so much more going on..The balloon relase was so awesome. Cindy I pray for your family.I read each post. Maybe when times get better you can write books you have such a way with words.. so real..Maybe books about kids with cancer or your time dealing with it. You are gifted myfriend...I know your family is in so much pain right now. Ty is such an awesome little boy. I am sure it is comforting to him that you and family are there...I pray God gives you the strength even on a moment to moment basis. What I learned when my sweet little cousin who was never sick a day in her life went down fast and hard for her tumor was on the brain stem.. I had two little boys at the time but her time in the hospital I was by her side. She is a precious little angel now but I remember she was at my house and was coloring before she got ill I told her color me something special and she colored me a butterfly she says because buterflys are free. I still have that drawing many years later..
Ty is ever so special and so are you !! your whole family has awesome smiles I noticed that in the pics you post... thanks for taking the time to keep us informed.I have cried and smiled and laughed with you !! I have been reading every post, although it almost breaks my heart to do so. What you are facing each day is a reality that I just can't bear to even think about. We are only 8 months into this fight with Sean, and although I pray we never have to face this same harsh reality you are living each day, you have shown me how to handle anything that comes our way with courage, love and strenght. You, Lou, Gavin and Ty are an inspiration. I couldn't agree more about the gold ribbons!!! It's amazing how right on Oct. 1, everything is PINK. Like you said, not to take away from breast cancer awareness, but I would love to see the same kind of awareness for pediatric cancer. There just aren't enough "happy endings" for these kids. With awareness comes fundraising and with fundraising comes a chance for a cure. More than anything that is what I want...a cure and one of those happy endings for both your son and mine!!! I would love to work together on a "Go Gold" effort next year!! We will be thinking of you and Ty as we run in the 10K this week-end. I'll join in for the Go Gold push for next year too!!! I have no problem being pushy and asking people to pitch in for an important cause, especially this one! I really believe a miracle is being performed for Ty. I really really do! God is great. Let's all continue to pray for this little boy who has touched us all so much. Ty, My continued thoughts & prayers are with you & all of your family. God Bless. Like some others, I was introduced to Super Ty through Rockstar Ronan. And like the others, I think of Ty every hour of every day. He's absolutely beautiful. Seeing his precious smile makes ME smile, but then I get angry because he shouldn't be going through this! No child should. Kids like Ty and Ronan make me want to shout from the rooftops, "F--- you, cancer!!!" They make me want to DO SOMETHING to help, but I just don't know what I can do. So for now, please accept my donation to The Ty Louis Campbell Foundation, and know that I'm thinking of you yesterday, today, and always. Mine too. Every minute of every day. Hope Ty has a much better night today. 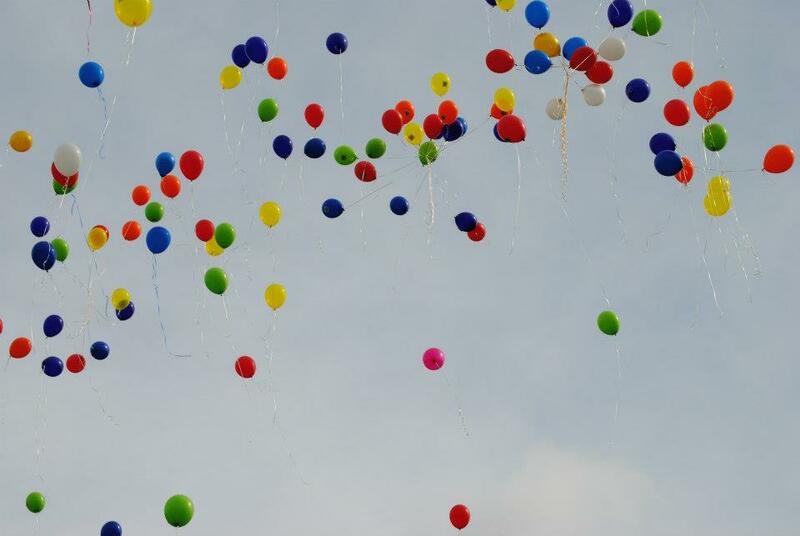 I love the balloon release pics. I know all those prayers will get to God. Thinking and praying for you always. Since I recently heard your story, I have been following your blog and have included your family into our nightly prayers. I thought this would make you smile. As I was asking my three year old what he thinnks God has planned for Ty, he said, "I don't know. mmmm....I know, a bouncy castle." I asked him who Ty is going to play with in the bouncy castle and he replied, "all the kids, me, us." We will keep praying for Ty and, of course, for a special super miracle. I know watching Ty suffer is beyond painful for you. You want to take away all the pain at all costs. If Ty is still here with you he is not ready to go... for whatever reason - maybe in my deepest hopes it is because his miracle is around the corner. My sister lost her five and a half year old daughter in a tragic accident 15 years ago. Not a day goes by when we don't think of her and miss her terribly. When my friend passed of lung cancer at 27 six months later, my sister said at least her family got to say goodbye. To tell her how much they loved her. How much she meant to them. We don't say these things to each other every day. We should but we get busy... life carries us through our day and these moments slip away. Oh how I wish we had even one more day with her. I would have held her and never let her go. I would have told her how much I loved her. No matter the time, it is never enough. These days you have with Ty are a gift... and his vitals are strong. No one wants to see their child suffer. No one. So if this is leading to a miracle then what a better way to start his healthy life. And if this is tragically leading to his final journey, then what better for him to know what he means to you and to sooooo many people. I said this before, he has touched the lives of so many people. Not many get to say that. Sending you more love than my arms can hold to Ty and your family. Traveled to Rome for work and was at St. Peter’s today, said a very long prayer for Ty.I think prayers must go to the head of the class when you say them at the Vatican?? Praying for peace for all of you. As always Super Ty, his mommy, daddy, and little brother Gavin are in my thoughts and prayers every hour of every day. My heart aches for you all. I couldn't agree more with you about the fact that the pink ribbon is found everywhere yet the gold ribbon that represents pediactric cancer is not even known to many. I think you and another mommy who lost a little boy would be a great team when it comes to September pediatric cancer awareness month, world wide, nfl, everywhere. I think you two would complement each other very well and one's weakness may be ones strength. I read the email you wrote and it was beautiful. My older son has to wear pink socks for his football team and it made me angry. I am in NO WAY saying that breast cancer is not important and that October should not be all about breast cancer awareness, but what I am saying is it makes me sick that no one does much for these kids. I really do think that you guys can really change the way the world sees and funds pediatric cancer. I just recently learned of her son's story and did read a few of her blog posts. So sad. . .
You have such a gift with words Cindy, and I truly believe that you are going to make such a difference. I just wish that Ty was not suffering. He is such an incredible little boy. When I think of yesterdays post, I still get the chills. I think about Ty and your family all the time. And by the way, if it is up to me, I will be making sure that the Perry Hall Gators will be wearing Gold socks and shoe laces next September. I will personally go out and purchase them for the league. . . I hate to admit it but I was not even sure what color ribbon pediatric cancer had. But now that I know I will find some gold ribbons and wear them everyday of the year. It is chilly in Michigan right now so today when my grand daughter bought me some of her bubbles I was like not right now maybe later when it gets warmer, but then I thought was harm are these bubbles really going to cause anything that I own. To see her laugh and smile at the bubble was priceless. I have Ty to thank for showing me that the small things are just that small. As for you wishing that the process would not take so long, Your a mom and hate seeing your child go though so much. Today is the feast day for St. Denis, the patron saint of headaches. I prayed for a miracle for your sweet boy Ty. You are all in our prayers. Oh Ty, you are always in my thoughts. I pray for a miracle, a healing of your whole body. I cry over happy and sad posts, I'm a mess. Cindy I can't even imagine what your life is like, living in limbo, day to day never knowing what is coming your way. The ache in my heart never goes away. I love you all so much. I wish there was something that somebody could do but we all know it is in God's hands. Please kiss that precious boy of yours for me. Tell him how loved he is by thousands of people all over the world. I hope that brings a smile to his face. Thinking of you and your lil boy. Your posts each day fill my own heart with the stresses and grief of not knowing - the saying no-yes-no-yes - and then closing my eyes in prayer that God's will be done. The miracle. PLEASE, the miracle! And then once again closing my eyes in prayer and faith in God's will. You are held and loved by so many hearts. And Ty IS the miracle. I echo what Elaine said. I am with you in spirit, every minute of every day. I read your posts every morning. It's my reflection time. The time I am alone in the still of the early morning and can weep openly and fully over the unfairness of your situation. Please know we are here with you, to lift you up in prayer and hope for complete healing of your precious precious Ty. Tell him how people all over the world are thinking about him and wanting him to know how proud we are of him and how brave and strong we know he is. Feel the power of our prayers and feel the presence of your angels and Ty's angels to surround you and bring you comfort during your dark hours. I am in awe of your strength and perseverance. Complete awe. What a magnificent mother you are. I know exactly what you mean about wishing it would hurry up and do something, one way or the other. No, you never want him gone, but the suffering is unreal. I lost my mom to cancer and was her caregiver in her final days. Hospice came in 4 months before she died. From the day they started they swore she had 2 weeks. For 4 months no one could figure out how she kept on because it was always 2 weeks, at most. She suffered ridiculously and it was incredibly painful to watch. There were days when she would be coherent enough that she'd be begging me to just kill her. And it was weird - you want that and yet you can't do that at all. I know exactly what you mean. I just wanted the suffering to stop. She didn't deserve that - she'd been a caregiver all her life, for 55 years all she did was make people's lives better. To not have been able to do anything to make her life better in that phase was horrid. And it's so much different when it's a child vs. a parent. I can only imagine that what you are feeling is at least 10 times what I was feeling back then. Parents should never outlive their children. I am sending love and support as best I can. Prayers will continue. I hope the nausea is being better controlled and that you all are getting rest today/tonight. PLEASE GOD GIVE TY THE HEALING MIRACLE HE NEEDS AND SO RICHLY DESERVES. This boy has done so much in his short life to teach so many valuable life lessons. He deserves a healing miracle, I beg of you to show him mercy. What a beautiful sight to see all those balloons with prayers rising up to the heavens - please God heed their message!!! Thinking of you always Ty - sending love and hugs your way and your whole family!! Praying every night and trying to be as good of a mother as you each day. I love your Ty stories. I wish I had thought to write things down like that. They will make you smile and cry in the future. I do know what you mean. I often have thought that if I never had Tyler he would never have had to suffer through four years of surgery, radiation, chemo and more radiation just to have trouble eating, swallowing and being an 18 year old boy. The selfish part of me is glad he was here but I am so sorry that he had to suffer even one minute of one day. The truth is that the doctors and nurses don't know how long someone will live and we have to keep smiling and encouraging and loving our children as long as we have them here with us. I miss my boy every day and as it approaches two years, the weight and pan are often unbearable. I don't pray but I send you all the good vibrations and best wishes I can muster and hope that somehow Ty will get yet another chance at live. What a beautiful celebration of an amazing little boy! Gavin looks so cute too! So many people love your family and pray for that well deserved miracle. Sending good thoughts of healing, puddles, candy and Popsicles your way Ty! You and Ty are such an inspiration. While being in total awe of you, I am also very heartbroken for you. Ty is so beautiful, inside and out. I took my daughter to sign up for basketball at our rec center, and the kids wanted to go to the park to play afterwards. Despite it not being what I wanted to do right then, I gave them a big affirmative and thought of Ty the entire time we played. Thank you for that! I am praying for a miracle many times a day. And like so many others, I cannot stop thinking about Ty. He is so precious. 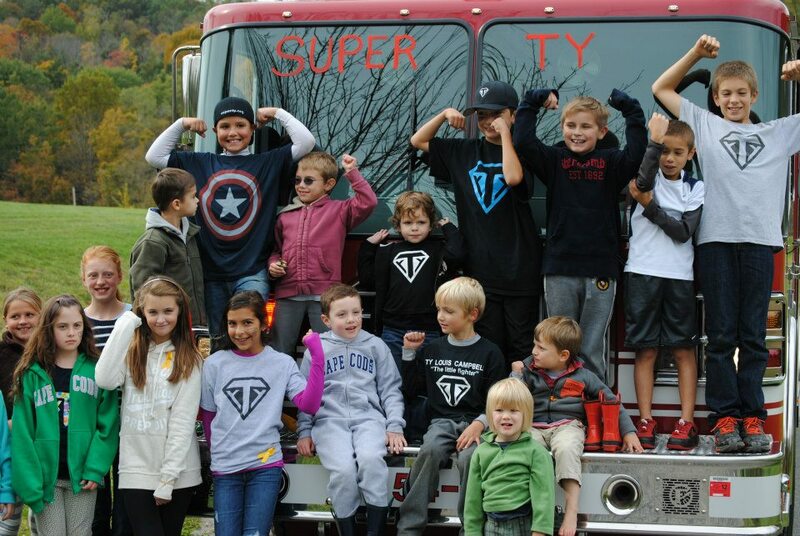 Thank you for the pics of the beautiful kids in your community coming together for Ty. They are so darling and uplifting. BELIEVE.......Cindy you should never question all that you and Lou have done for TY. Your feelings are the most beautiful, heart wrenching words I have ever heard in my entire life. Always know you are the best Mom a child could ever ask for. God Bless you all. Love you Super Ty !! I'm praying for your beautiful boy-no more suffering for your child. I love the ice-pop story-what a precious,funny memory! We have a mutual friend and I have been reading your blog for over a year. Even though I have never met you, I love you and your beautiful little fighter. Ty is amazing, he has been through so much and has suffered as a child more than any adult I know who has suffered from cancer, his smiles are a gift . I hope my prayers contribute to a miracle. I ran in central park today and prayed the whole loop for Ty as I couldn't make the run this summer. I wish I met him then. There is not a word to describe you, there is no such word, you said it perfectly, thank god for you, for being Ty's mom. All my blessings, I will continue to pray, I love Ty, that beautiful boy, so much. Always remember what an amazing mom you are! Ty is as blessed to have you all as his family as you are to have him! Always in my thoughts and prayers! I cannot begin to imagine the pain your heart must be filled with. My heart is so heavy just reading your words, to live this nightmare is unfathomable to me. I pray God heals your beautiful baby boy completely and perfectly. Your strength is without comparison. You are a beautiful soul as is everyone in your family. May God bring you peace, but much more bring peace that surpasses understanding to Ty's every thought, every breath, every day. I love you all so much though I have never known you except through your blog. God bless! I heard about your story and was absolutely heartbroken, yet amazed at the same time. Heartbroken because a five year old should NOT have to live this way, a five year old should be living care-free. I am amazed because Ty is the strongest little guy that I have ever heard of.. Cindy and Lou - your strength, courage and hope are truly inspiring. You have raised a very special little boy, who will (and already has) change this world for the better! The picture you posted a few days prior, with his hands forming a heart, melted my heart. The smile on Ty's face is.. beautiful, absolutely beautiful! I am a police officer in Minnesota. When I heard about Ty, his story and his love for Captain America... I thought "I need to help this family, this little super hero, spread the word about this awful beast called cancer." I went out and purchased a GOLD, Captain America keychain in honor of Ty. I attached it to my duty belt, to ensure that it is always close by. The football players may all wear pink, but my partners and myself added GOLD to our uniforms for Ty and the elite group of Angels in Heaven who were taken far too soon! Next year, we will swap out our regular handcuffs for GOLD ones. Stay tuned for pictures in September 2013 :)) and thank you for sharing your handsome little super hero with us! God Bless! The picture of you kissing Ty on the nose on the front page of the Journal News is the same way I kiss my boys goodnight. I trust that they will awake in the morning strong and healthy and that helps me to sleep. Ty was born to teach you, Cindy (and your family), how to love completely. Don't worry: you'll be a wonderful momma to Gavin. My thoughts and prayers go out to you and your family. Ty is such a beautiful and strong boy. And while it is not fair that he and your family should have to suffer, it is wonderful that you are able to see beauty and find bits of happiness in each day. I hope that Ty begins to feel better after his tough day with a fever. He is lucky to have such a great set of parents! I also love the ice pop story--very cute and funny! And the release of TLC was a great idea.